Some facts about the amazing Cheetah, for this week's Thursday Thirteen. 1. Cheetahs are the fastest of all land mammals, reaching speeds of up to seventy five miles per hour. 2. Cheetahs are in fact capable of generating incredible bursts of speed, reaching from zero to hundred kilometers per hour in less than three seconds, outdoing most modern sports cars. 3. Often considered as the smallest of the big cats, Cheetahs are unique since they can only purr and not roar like the other great cats. 4. Another singular attribute of the Cheetah is presence of semi-retractable claws. This enables them to maintain their grip on earth in high speed pursuits. 5. Cheetahs also have distinguishing markings on their cheeks, resembling 'flowing tears', that reflect sunlight and enable the cat to see clearly for long distances during a chase. 6.Essentially built for the kill, Cheetahs have long streamlined bodies and a rudder like tail, that assist the cat in its movement and balance during quick turns in a chase. 7. Yet other adaptations exist that have enabled the Cheetah to evolve into prolific hunters. These include large heart and lungs, big adrenals and wide nostrils - all assisting the felid in making cardiorespiratory adjustments for their stressful charge. 8. Owing to the great effort that Cheetahs put in their hunting approach, they tire easily. Their body temperature reaches dangerously high levels following their sprint and thus they must rest afterwards. It is at this point in time that they are most vulnerable and often lose their hard-earned kills to opportunistic predators like hyenas and vultures. 9. Therefore, due to competition, Cheetahs hunt during day instead of night and eat quickly and nervously after taking down the prey. 11. Cheetahs have an organized social structure, with females leading a solitary life after rearing of the cubs and males usually bonding and hunting in groups to lead a territorial existence. Turf wars occasionally occur between males and are often bloody and fatal. 12. Even though Cheetahs have a large litter size, lack of genetic variability and conflicts with larger predators including lions, leopards and hyenas mean that only a fraction of Cheetah cubs reach adulthood. This does not bode well for their already dwindling number in the wild, owing to shrinking habitats and conflicts with humans. 13. Unique from leopards and jaguars due to the presence of spots instead of rosettes, and a lighter body, Cheetahs are placed into a separate genus for taxonomic purposes. Acinonyx Jubatus, the remarkable cats exist today in limited numbers in Africa and Asia (Iran). Largest population is seen in Namibia, Southern Africa. Animals sure can be interesting when you start researching them! I think Cheetah's are the most beautiful cats..and the fastest! Slender and sleek physique; big heart, lung and adrenal glands assist the Cheetah in running fast. 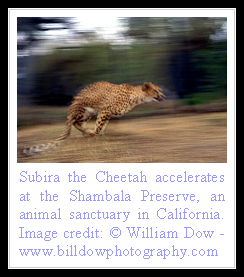 In truth the whole of Cheetah's body is evolved to make it a perfect sprinter. i think this website is very useful for a project i am doing i science class, i told my friends i added a little bit to the facts for the project but actually i ended up with 3 pages of information. this was awsome i think that i will get an a+ on my work thanks a lot!!!! this is really neat. I liked the movie african Cats! cheetahs are so so so so cool. i love cheetahs. cheetahs are my faveret animals!!!!!!!!!!!!!!!!!!!!!!!!!!!!!!!!!!! cheetahs are so cute and so so so so cool they are my favert animals!!!!!!!!!!!!!!!!!!!!!!!!!!!!!!!!!!!!!!!!!!!!!!!!!!!!!!!!!!!!!!!!!!!!!!!!!!!!!!!!!!!!!!!!!!!!!!!!!!!!!!!!!!!!!!!!!!!!!!!!!!!!!!!!!!!!!!!!!!! Cheeta's r cute! and FAST!